Nypave 20 is a paving grade bitumen and is produced according to EN 12591 as well as Nynas quality specifications. A constant increase in traffic – both in terms of the number of vehicles and their axle loads – has put increasing strain on the road surface. The preferred immediate remedial measure was to restore the road surface on the stretch described. The road is considered to present to motorists a high risk of aquaplaning in wet conditions so therefore also needed re-engineering in terms of surface drainage. The ground breaking asphalt mixture EME was developed in the early 1980s in France. This 'Enrobé à Module Élevé' (or high-strength asphalt) was used for load bearing layers in road pavements subject to particularly high traffic. The increased strength of EME layers provides greater resistance to lasting deformation. 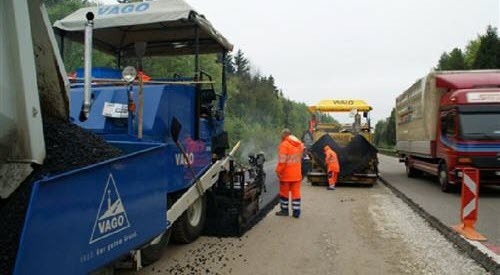 For the N03/56 Zürich-Wollishofen to Wädenswil remedial works, around 25,000 tons of AC EME 22 coats were produced with Nypave 20 hard bitumen. The proportion of recycled material was 30% (EME C1) and 40% (EME C2). The daily output was an average of 1700t asphalt rubber compound; and a total of 35,000t of asphalt was laid. Nynas focussed on optimising the hard binding agent used. The company was able to find a balance between sufficient strength on the one hand and good fatigue characteristics on the other. Daily checks on the rubber compound by the contractor, the client and the production company guaranteed high standards of quality. All the specifications of the Nypave hard bitumen for EME coatings can be found in the product data sheets available separately. With binding agents, the challenge is to provide an optimum combination of strength with appropriate resistance to fatigue. The aim is that the mixture can retain the balance between the parameters which define resistance to fatigue (such as the typically high proportion of bitumen in an EME mixture) and those which have an effect on the formation of tramlines. In order to ensure that the EME solution is successful, it is absolutely vital that there is good cooperation between the bitumen producer, the road construction administration bodies and the asphalt producers. Download this information on how Nypave 20 was used at N03/56 Zürich-Wollishofen to wädenswil as pdf.